More friends and a blog: Revealing the stash! While taking stock of what yarn I have (and trying to get some projects in mind), I couldn't help but notice the lovely rainbow of yarn I have. This is it all, excluding the bits left over from previous projects and the yarn currently being used in WIPs. Some of the yarn has a project in mind (like the sock yarn and the white wool for a sweater), other yarn is just waiting for me to be inspired. Love the looks of all your sock yarn and that rainbow of wool. 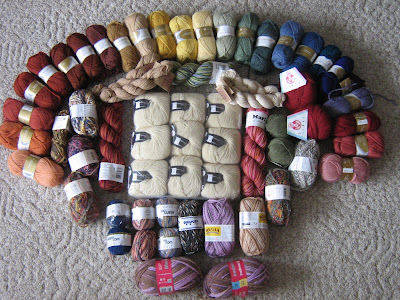 Oooo, I love the colours in your stash - it's like a yarn rainbow! Is that all Peruvian Highland Wool in that lovely rainbow across the top? V tempting to collect every colour when it comes in such a pretty range! 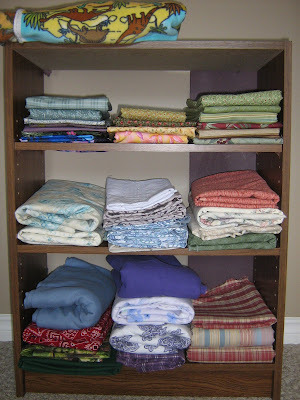 You definitely need more fabric - those shelves look way too empty. OH my! The colours of yarn are very inspiring...and they look so pretty the way you've arranged them. Ha, ha. Miss Heather. I do not clear out the fabric section at S.A. I was in there yesterday - on sale day - and I didn't buy any fabric. So there.